It has been a busy few months for Kernl. Lots of great work has gone into the WordPress load testing feature work as well as a few structural changes to increase reliability. 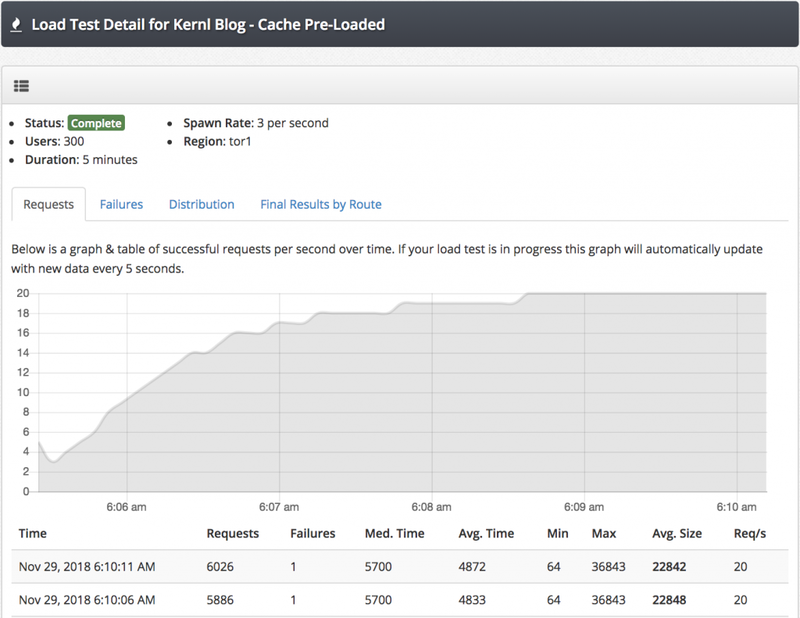 Cache moved to Redis – For as long as Kernl has existed our cache backend was powered by Memcached. We have now finished migrating to Redis hosted at Compose.io. AngularJS Upgrade to 1.7.5 – Fairly straight-forward upgrade to Angular 1.7.5. We wanted to take advantage of performance improvements and few bug fixes. WordPress Load Testing – Over the past few months we’ve been cooking up something new. Imagine if you could easily test performance changes to you or your client’s WordPress installation? Or be able to tell your client with confidence how many customers at a time their site can support (and what their experience will be like!). What if you could do all this without writing a single line of code or spinning up your own testing infrastructure? We’re ready to start beta testing so send an email to jack@kernl.us if you would like to be a part of it.